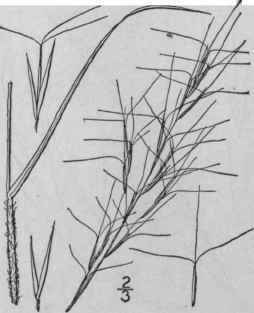 Aristida lanata Poir. in Lam. Encycl. Suppl. 1: 453. 1810. Not Forsk. 1775. Aristida lanosa Muhl. Gram. 174. 1817. Culms 2°-4° tall, erect, simple, smooth and glabrous. 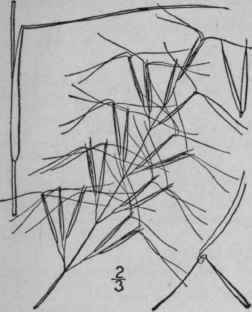 Sheaths longer than the internodes, crowded at the base of the culm, woolly; ligule very short, minutely ciliate; blades 1° long or more, about 2" wide, attenuate into a long slender point, smooth beneath, scabrous above; panicle 1°-2° long, strict, branches erect or occasionally somewhat spreading; outer scales of the spike-let awn-pointed, the first 5"-7" long, exceeding the second; third scale slightly shorter than the second, middle awn 8"-12" long, usually horizontal, the lateral awns about two-thirds as long, erect or divergent. Dry sandy soil, Delaware to Florida, Oklahoma and Texas. Aug.-Sept.
Aristida divaricata H. & B.; Willd. Enum. Hort. Berol. 99. 1809. Culms 1 1/2°-3° tall, tufted, erect. 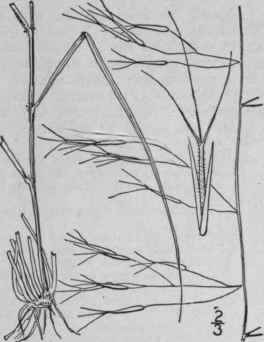 Sheaths overlapping, rough, usually with a tuft of long hairs on each side at the apex; ligule a short ciliate ring; blades smooth beneath, rough above, those of the culm 6-12' long, 1"-2" wide, erect or ascending; the sterile shoots from one-third to one-half as long as the culm, the leaves narrower; panicle comprising one-half of the plant, or more, often included at the base, its branches rigid, at length widely spreading; spikelets, exclusive of the awns, about ¥ long, numerous; empty scales acuminate, usually awn-pointed; flowering scale commonly slightly shorter than the empty ones, firm, sometimes spotted with purple, hispidulous above; awns not articulated to the scale, the lateral ones shorter than the central, which is 6"-10" long; callus pilose. Dry sandy soil, Kansas to Arizona and Mexico. Aristida tuberculosa Nutt. 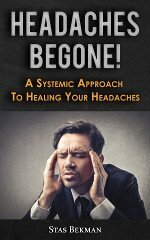 Gen. 1: 57. 1818. Glabrous, culms 6'-2° tall, erect, dichotomously branched, smooth. 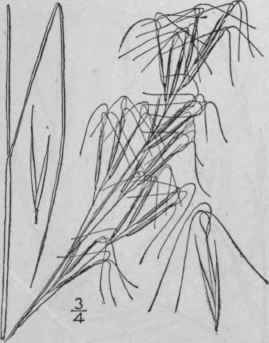 Sheaths shorter than the inter-nodes; ligule short, ciliate; blades 5'-9' long, about 1" wide, attenuate into a long slender point, smooth beneath, scabrous above; panicle s'-8' long, branches slender, ascending; outer scales of the spikelet about equal, awned, the third scale shorter; awns divergent or reflexed, more or less coiled, united at the base into a column 3"-6" long which is articulated to the scale. Sandy soil, especially on sea-beaches, Massachusetts to Georgia. Also about the Great Lakes. Long-awned Poverty-grass. Aug.-Sept.
Aristida desmantha Trin. & Rupr. Mem. Acad. St. Petersb. (VI.) 5: 109. 1842. Culms 1°-2° tall, erect, branched, smooth and glabrous. Sheaths shorter than the internodes, smooth, glabrous or the lower sometimes pubescent; ligule short; blades 6-12' long, less than 1" wide, attenuate into a slender point, smooth beneath, scabrous above; panicle about 6' long, the branches slender, ascending; outer scales of the spikelet about equal, the third one shorter; awns spreading or reflexed, somewhat coiled, united at base into a column less than 1" long, which is articulated to the scale. In dry soil, Nebraska to Texas. Aug.-Sept.